Many folks at home are unaware of the technology where, with inexpensive devices, you can create a wired computer network within the confines of your home by using your existing electrical wiring. Setting this up is actually quite simple (plug and play) and be done by using the devices manufactured by TP-Link. Typically one device is plugged into an electrical outlet at your router then plugged (via ethernet cable) to your router. The other device(s) are then plugged into outlets in your home, paired with the main one at the router, then plugged into the computer or components using an ethernet cable. Wired networking will give you better security, speed, and performance; which, are the main reasons to give this a try. It is one of those networking options that people do not think about and/or are totally unaware of. This eliminates having to run networking cable all through your house and is a good option if your wireless connectivity is poor in certain areas. Amazon has the NETGEAR AC750 WiFi Range Extender with $10 off the regular price, plus apply the extra savings coupon, that is currently available, to get an additional $5 off… This extender is ideal for boosting or extending the range of your existing WiFi network. The NETGEAR AC750 Wi-Fi Range Extender + Extra Outlet is a number one best seller at Amazon. Extend 2.4 & 5GHz Wi-Fi up to 750 Mbps & reduce interference for better Wi-Fi coverage (and a noticeable boost in speed). My Reset Experience With Windows 10 – I recently performed a reset on my Windows 10 based computer and found the experience to be quite positive. I thought I would share some pointers with you so that if you have to perform a reset, it is not a scary experience. Even though the reset preserves your personal files, I highly recommend that you always have a backup of any files on your computer that you cannot live without. To get to the reset option in Windows 10, click on the Windows Start button (bottom left corner), go to Settings > Update & security > Reset this PC > Get started and choose an option. The option I chose was to reinstall Windows 10 and keep my personal files. This option will reinstall Windows 10 and keep your personal files; will remove the apps and drivers that you originally installed; will remove the changes made to any settings (and return them to the default settings); and, will remove any apps that the PC manufacturer installed (Note: If your PC came with Windows 10, the apps from your PC manufacturer will be reinstalled.). After I launched the reset on my PC, it was pretty much hands free; and, what I really liked was that following the reset, Windows 10 generated a html page on my desktop titled “removed apps” that listed all of the programs I originally had installed on my computer. I had already written down what I wanted to re-install, but this list came in quite handy. In the end, the reset took approximately a half hour to 45 minutes and I can honestly say my computer is cleaner and faster. How To Mark All Your Unread Gmail’s As Being Read – After performing a reset on my Windows 10 computer, I found myself motivated to do some housecleaning in my Gmail account. One of the issues I ran into was that I had hundreds of email’s that I did not read. As a result, I needed and wanted to mark those emails, as being read. The problem with this is that Gmail will only allow you to bulk select only a certain number of emails. This is where I started thinking, “there has to be a way to mark all the emails in my account as being read”. After performing some online research, I found an article at a site called Chron, titled “How to Mark an Entire Gmail Inbox as Read“. By using the Google Search box in your email as a filter to generate all unread messages, and following the step-by-step instructions, at Chron, you can easily mark hundreds (or thousands) of unread emails and change them to read. A Simple Program To Troubleshoot Network-Related Problems – If you manage a network, Win Network Tools may be helpful. The program provides a graphical interface (or launcher) of common command line tools that are built into Windows (that are typically run from the command prompt) and some other options (such as Speed Test) that will launch a site to test out your connection speed. What would be nice is if this program had a “portable app” option readily available for the tech toolbox. I did find that if I installed the program, and copied the “WinNetworkTools.exe” to another location (such as a flash drive) I was still able to run the program. I then uninstalled it from the computer. Nice concept… May contact the developer to suggest the portable app idea. Shield Your Electronics From Electrical Power Surges – When Christmas rolls around many of you may be installing new electronic equipment. What we have a tendency to forget is to purchase a surge protector to help protect the equipment from power surges. I went on the hunt to find what I think is a good investment and came up with the Tripp Lite 8 Outlet Surge Protector Power Strip 25ft Cord Right Angle Plug 1440 Joules . 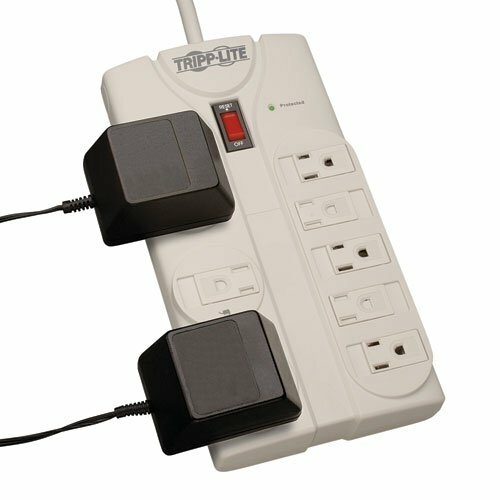 This Tripp Lite Surge Protector has a 1440 joule surge suppression rating with EMI/RFI line noise filtering to help components perform at their peak while extending their lifespan; 8 outlets with 3 specially designed to accommodate transformer plugs without blocking other outlets; an extra-long 25 foot cord with space-saving right angle plug; diagnostic LEDs that alerts you to the protection and grounding status; convenient built-in outlet safety covers to protect young children from possible harm and prevent dust from eroding internal components; and, a lifetime Warranty and $75,000 Ultimate Lifetime Insurance for connected devices. On top of this, to support my opinion on this, this surge protector is carrying a 5-Star rating. If you use the Google Chrome Browser, did you know there is a built in feature (called Cloud Print) that will allow you to set up your home (or work) based printer so that you can print to that printer from any web based device (such as your smartphone, tablet, Chromebook, etc…)? This is a really handy feature when you are out and about and would like to generate a printed hard-copy of a document. Once you have Google Cloud Print setup, Cloud Print gives you the ability to store and manage (keep a history) of your print jobs. Google Cloud Print works with all printers, but for the best printing experience we recommend that you use a Cloud Ready printer. You can connect a printer to your Google Cloud Print account in seconds, and immediately start printing to it. If your printer is Cloud Ready, follow your manufacturer’s provided instructions or see setup information for Cloud Ready printers. To connect your classic printer, enable the Google Cloud Print connector using a Windows or Mac computer that’s connected to the printer. You’ll need Google Chrome to be installed on the computer. If you’re using Windows XP, make sure you also have the Microsoft XML paper specification pack installed. When I am in the need to purchase tech items, such as a printer, I head over to Amazon to see if the item is available (which it most likely is), then I pull up the customer reviews (from real people). I know some of the reviews may be planted, but the majority are for real and it can give you a good handle on what to expect. In this case I was browsing around for an economical printer and I happened across the Canon PIXMA MX922 that has favorable reviews and is just the size I need for the space on my desk. I cannot rave enough about the Android app called ES File Explorer Manager. If you need an app to manage the files on your Android device, this is the one to get. What has sold me on ES File Explorer is the networking capabilites that is built into the app (such as LAN, Cloud, FTP and Bluetooth). For example, instead of installing separate apps for your online file storage accounts, you can access those accounts through ES File Explorer (accounts such as the popular GDrive, Box, Drop Box, & SkyDrive). What I especially like is that I can access the shared files and folders on my desktop PC to move files to and from my Android Devices (and the computer). ES File Explorer is a free, full-featured file and application manager. It functions as all of these apps in one: file manager, application manager, task killer, cloud storage client (compatible with Dropbox, Google Drive, SkyDrive, Box.net, Sugarsync, Yandex, Amazon S3, and Ubuntu One), FTP client, and LAN Samba client. The SanDisk Connect Wireless Media Drive stores and streams your photo, video, and music collections wirelessly on up to eight mobile devices. This convenient pocket-sized drive requires no Internet connection or messy cables, so it can travel with you anywhere. It includes 32 GB* of storage, so you’ll have plenty of room for all your favorite movies and high-resolution photos. The Best Device For Reading. Period. and, Expand your home network with this 5-port network switch. A credit card is required to ship the key, so in case of fraud, identity can be traced back. We’ll cooperate with law enforcement inquiries in case of fraud (nothing like that has ever come up). We don’t accept flyby pictures of keys: the key must be held in the person’s hand, with their fingers visible. If you are a regular here at What’s On My PC, you are probably wondering what is going on with the blog. To put it bluntly, I have been going through blogger’s burnout and decided to try something different, using the Geek Squeaks’ theme that I have used in the past. I am hoping it is something you will enjoy and really get something out of. There is so much out there and this is one way to introduce you to other Tech Sites and at the same time share information with you in a beneficial way. Be more creative – with unlimited possibilities using text, images or 3D watermarks. Save time – batch watermark thousands of photos without user action. Wireless networking and connectivity in the home is great, when it works; however, it is not uncommon to run into spots where connectivity can fluctuate from good to bad to dropped connectivity altogether. I have been experiencing just that with my Lenovo Nettop Computer that is in my garage. It became quite frustrating; and just about the time I thought I resolved the issue, the issue would laugh back at me and surface again. To resolve the problem, once and for all, I decided to give the TP-LINK TL-WN822N Wireless N300 High Gain USB Adapter a try. For under $20 bucks, what did I have to lose. This adapter sort of reminded me of a flat headed rabbit (with its’ dual external antennas). It simply plugs into a USB port on the computer via the supplied 1.5 meter cable. I do recommend, prior to the install that you disable your existing wireless adapter (in device manager) and that you do not install the software that comes with this adapter and only install the driver. I found that the built in wireless management software built into Windows will do a much better job, with a smaller memory footprint. In the end, my wireless connection is now in the awesome category with no dropped connections. The TP-LINK TL-WN822N Wireless N300 High Gain USB Adapter offers wireless transmission speeds of up to 300 Mbps and complies with IEEE 802.11b/g/n standards. Dual external, 3 dBi, omnidirectional antennas deliver stronger signal penetration strength and wider wireless coverage, making the adapter ideal for sharing files, making Internet calls, or watching HD streaming media. This product’s QSS (Quick Secure Setup) function complies with the WPS standard to ensure the security of your wireless network. The Wireless-N USB Adapter supports 64/128-bit WEP encryption, as well as WPA/WPA2 and WPA-PSK/WPA2-PSK encryption and mechanisms. These combined security measures are designed to deliver stronger, safer protection and guard against intruders. The Wireless-N USB Adapter measures 7/10 by 3-1/2 by 2-7/10 inches (H x W x D) and is supported by Windows 2000, Windows XP, Windows Vista, and Windows 7. It is compatible with other 802.11b/g/n protocol wireless products, as well as Intel Centrino technology. The Wireless-N USB Adapter is backed by a two-year warranty. Wireless-N USB Adapter, quick setup guide, USB cable, and resource CD. A very cheap alternative to networking computers together in your home, without running network cable, is to use networking adapters that are engineered to use the electric grid in your house. Typically you connect one of the adapters to your modem/router via ethernet cable, then plug the adapter into a wall plug. Then you place another adapter, plugged into a electric outlet, that is subsequently connected to the device .(i.e. Smart TV, Gaming Consoles, Home Surveillance Device, etc.) that you desire to connect to. After the adapters are setup, you simply sync the adapters by pushing a button on the adapters. Once they are synced and the lights on the adapter show a connection, then you are networked. To give an example of such an adapter, I took a look at the Rosewill RPLC-201PKIT 200Mbps Powerline AV Pass-Through Adapter. What I like about this adapter is that even though it uses an electrical outlet, it gives you a pass-through outlet back so that you can still use the outlet. One thing about these adapters; do not plug them into a surge protector. This will cause the adapter to either not work or may seriously degrade your network bandwidth connection. A tech (and gardening friend) of mine (Puterguy) sent me this story (actually as a comment on the blog), that compelled me to share his experience with you in hope that it will help someone else. Rick: I ran into another first today. I wasn’t sure where to post it so network monitoring sounded kinda close. Story: The computer was not connecting to the the server and showing a disconnected or low signal. My first thought was the CAT5 wire was shorting somewhere or a bad network port. After testing the line AND plugging into another CAT5 port that I knew was working, it still failed to connect. I rebooted the computer and the BIOS was set to check for LAN boot and there was a message which said something about Ethernet boot corrupted. Right away I am thinking “bad network card or BIOS corrupted”. I left it boot and logged in to still find the same symptoms. I turned the computer off and started to disconnect everything to swap out the Ethernet card BUT noticed the light on the Ethernet card on. Since the card was “wake on LAN”, I decided to pull the power cord to sorta reboot the Ethernet card. I plugged the computer back in, hit the power button, and TADA, no more issues. Be sure to check out Puterguys blog [ click here ] which is a gardening and tech blog mix… Very unique! Is This The End of the Desktop and Laptop? If you are into networking, you most likely have heard of Radmin Remote Access Software. To promote Radmin, I noticed that they offer a FREE IP Scanner called Advanced IP Scanner that is helpful in locating and monitoring the devices (wired or wireless) that are connected to your network (home or business). Scanners such as this is helpful in identifying the IP addresses (which dynamically can change) and MAC Addresses of those devices. Years ago when I managed a network, I used an IP scanner such as this to make sure all of my network devices and computers were alive and functioning properly. 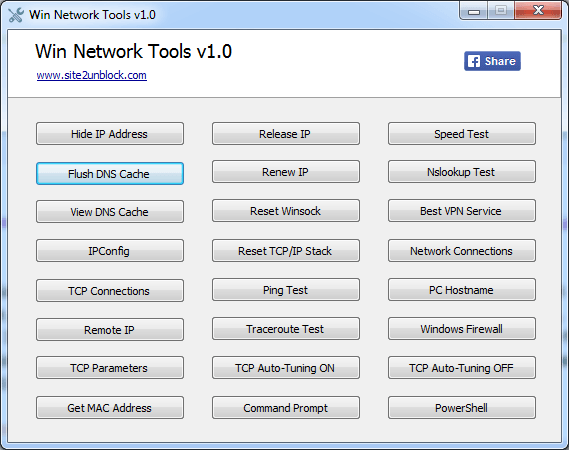 Advanced IP Scanner is a free, fast and easy-to-use network scanner for Windows. In a matter of seconds, Advanced IP Scanner can locate all the computers on your wired or wireless local network and conduct a scan of their ports. The program provides easy access to various network resources, such as HTTP, HTTPS, FTP and shared folders. It also enables you to detect all the IP addresses on your WiFi network. With Advanced IP Scanner, you can wake up and shut down remote groups of Windows machines. If you use Radmin remote access software, you will also enjoy the improved Radmin Server detection and integration capabilities, which allow you to connect to any scanned machine with Radmin Server. If you need a way to connect multiple computers together over the Internet, without worrying about firewalls, routers, or IP addresses, then checkout LogMeIn Hamachi. LogMeIn Hamachi uses the technology of Virtual Private Networking (VPN) to tunnel its’ way between connections over the internet. It is like having a local area connection (LAN), between your computers, over the internet. I am currently testing and using the FREE non-commercial version of LogMeIn Hamachi between my Desktop PC (Windows 7 Home) and my Netbook (Windows XP) over a wireless connection to create my own virtual private network, using a topology model described by the LogMeIn website, as Mesh Networking. Mesh networking. Connect all of your network clients to each other. Quickly and easily create a simple, virtual, mesh network that allows remote machines to directly connect to each other, thereby giving users basic network access to all the network resources they need. The install/setup of the client software took me less than 10 minutes for each PC. During the installation on my desktop PC I was prompted to give my PC a network name and then prompted to create a network ID and Password. During the Installation on my Netbook, I was prompted to give the Netbook a network name and then I selected “join an existing network”; at which point I typed in the network ID and password. The LogMeIn Hamachi client software (on the Netbook) started probing (searching) for the Desktop, on the network, and found it very quickly. I then setup a network share on the desktop. From the Netbook side, using the LogMeIn Hamachi client (see below), I clicked on “browse” and the share that I had setup, quickly appeared. Wow, what an easy way to setup a network. When downloading the FREE non-commercial version, you have an option of downloading a “managed version” and an “unmanaged version”. For the sake of creating my mini network, I went with the unmanaged mode. Unmanaged mode allows you and your friends or colleagues to set-up a VPN in a matter of minutes. However you will be limited to a mesh network configuration. Managed mode gives you the ability to create a VPN in one of three configurations: mesh, hub and spoke or gateway. You will have the ability to deploy clients to your users by emailing them a hyperlink, and you will be able to manage and monitor your networks and their usage centrally from LogMeIn.com. In the end, LogMeIn Hamachi was pretty easy to setup with minimal networking knowledge. One feature I really liked was that I could turn “off” my network by clicking on a “Power Button” at the top left corner of the LogMeIn Hamachi client software (see screenshot above). If you are a member of the What’s On My PC blogroll and you posted an article within the past 7 days, expect to see a link to your blog on Geek Squeaks’. It is my way of saying “Thank You” to my fellow bloggers; AND, my way of visiting each and every blog to read the “best of the best”! Has Facebook become too big for it’s boots? BookFundas.com is a FREE eBooks website with a comprehensive collection of popular ebooks written by famous authors from the world’s leading publishers. Most of the books I reviewed were in the Adobe PDF format. I found a very good selection of computer and technical books at this site, as well as, publications on subjects ranging from accounting to weightlifting. It appears that titles are added to the site on a regular consistent basis. BookFundas.com will be added to the “Freebies” section of this blog for future reference. You can click on any of the categories listed below and you will be redirected to the BookFundas.com web site. When managing a computer network, having the ability to remote into a PC on the network to provide help desk support or to perform maintenance, there is none better than the VNC (virtual network computing) software packages that are freely available. VNC allows you to share, view and control remote computers as if you were sitting in front of them. If you have several PC’s in the home environment that are networked, this is an excellent way to manage those PC’s to perform maintenance routines or to perform alternative tasks without having to physically sit in front of each PC. What “VNC Software” do I have on my PC? There are several VNC packages available: RealVNC , TightVNC and UltraVNC. I “currently” prefer UltraVNC over the rest of the pack. UltraVNC runs under the Windows operating systems (95, 98, Me, NT4, 2000, XP, 2003…), is available for free (under the GNU General Public License) and is constantly being improved. Vista is not reflected on the list; however, I am using it on a PC with the Vista operating system and have experienced no issues. File transfer , Video driver , optional Encryption Plugins , MS Logon , Text chat , Viewer Toolbar , Java Viewer with File Transfer , as well as Auto scaling and Server Side Scaling,Multiple-Monitors-support,Repeater-Proxy support, Auto reconnection, good performances and tons of other functionalities. Using UltraVNC to wirelessly connect to my notebook PC… In a previous post, I did a review on the Acer Aspire One Netbook computer [Click Here] that I recently purchased. Since that review I have setup the Aspire One to wirelessly connect to the internet via my wireless router or access point. I currently have the UltraVNC viewer installed on my main PC (Windows Vista) and the UltraVNC server installed on the Aspire One (Windows XP). When installing VNC software, the viewer is always installed on the computer(s) that you want to use to control the other computer(s). The server component is installed on the computer(s) that are going to be controlled. When installing the UltraVNC software, the installation routine walks you through the entire setup process. I have the Aspire One setup to automatically load the UltraVNC server, when booted, so that it is ready at any given time for a remote session. Using the UltraVNC viewer component on my main PC (Windows Vista), I “wirelessly” remote into the Aspire One. I’ve found that this works best if the Aspire One is working off the AC Power Adapter. The neat thing about this, and it works very well, is that I am pulling up and controlling the Aspire One, “wirelessly” from my main PC, with minimal performance loss This gives me the ability to manage the Aspire One and to perform other tasks (i.e. downloads, test software, perform updates, transfer files, etc…) without having to physically touch the (Aspire One) computer. The sole purposes of my setup is that I making good use of my computer resources; the Aspire One is not just setting around; and it is a great conversation piece when people visit and see me controlling another PC through thin air.